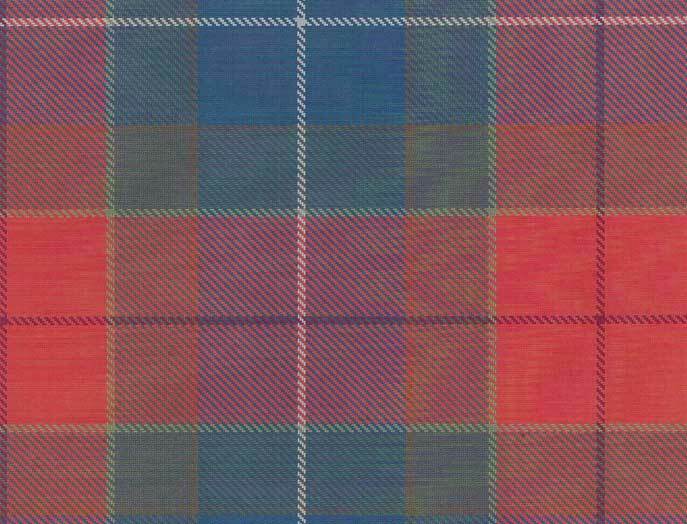 The tartan contains reminders of all that is symbolic around the village of Elderslie, which was always known locally as the birthplace of William Wallace. 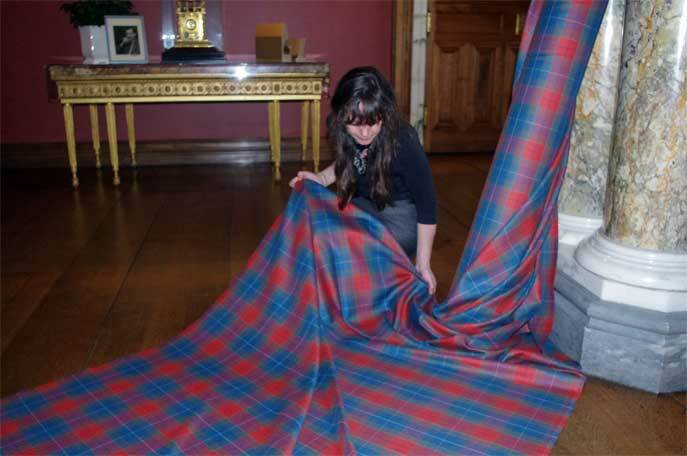 Christine, who designed this wonderful tartan, was born in Elderslie as was her father and grandmother. 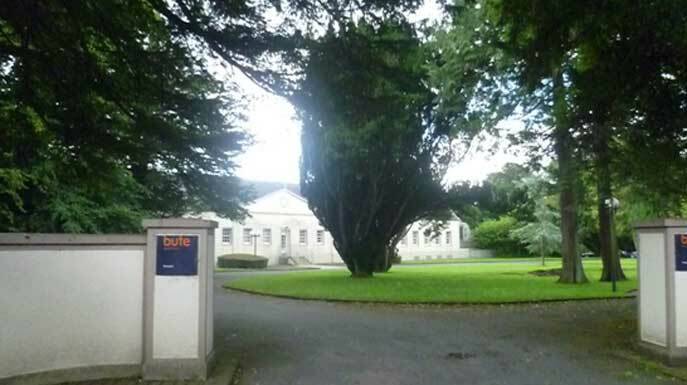 Her awareness of William Wallace stemmed from the many visits to the home of her great grandmother in Wallace Avenue, which directly overlooked the Memorial and The Wallace Yew. In 1974 the building was demolished. 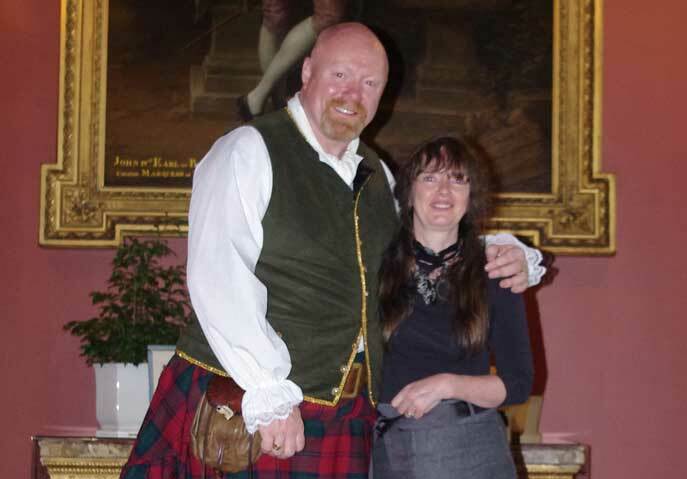 The irreverence to the birthplace of a national hero was the reason that, years later, Christine MacLeod joined the Society of William Wallace whose aim was to keep the name of the patriot alive. She was inspired by the book by David R Ross, On The Trail of William Wallace, David was also the Convener of The Society of William Wallace. She was interested in many aspects of Scottish history and culture and grew up in the village of Kilbarchan, learning the ancient craft of the handloom weaver, being taught the old skills by one of the last true handloom weavers in Scotland. David Ross wore the woven plaid and told the story throughout his time thereafter. It was worn on the 700th commemoration in Westminster Hall, where Wallace was tried for treason and in the memorial service in the little church in Smithfield, close to where Wallace was executed. David was very proud of the plaid, it was more than a tartan, it was a story in cloth. 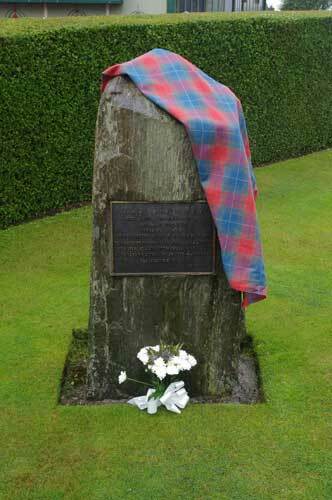 In memory of him, a small piece of the cloth is tied to the Wallace Sword, carried proudly by the members of The Society of William Wallace. 2012 is a special anniversary. 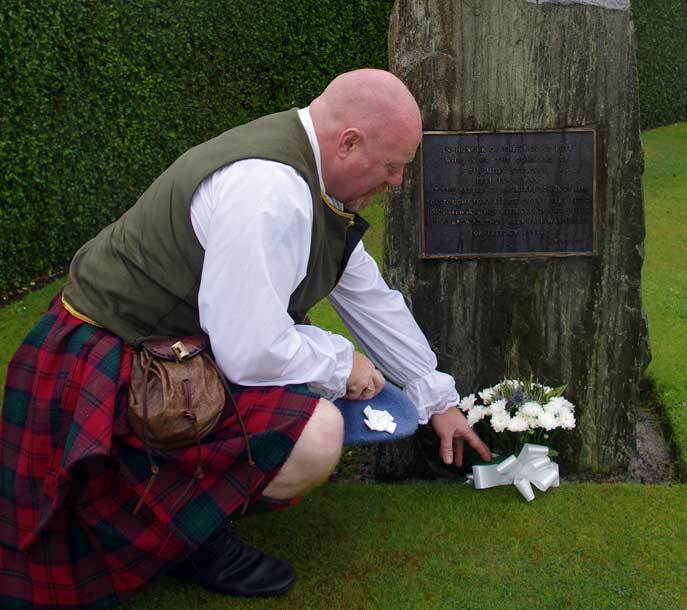 It is 100 years since patriots of Scotland collected together to ensure that a lasting tribute to the birthplace of a national hero was marked. 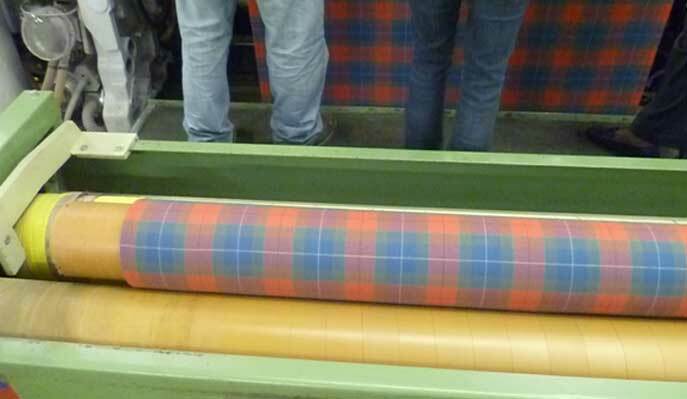 As a lasting reminder, to be passed on to future generations, a tartan has been designed by Christine MacLeod. 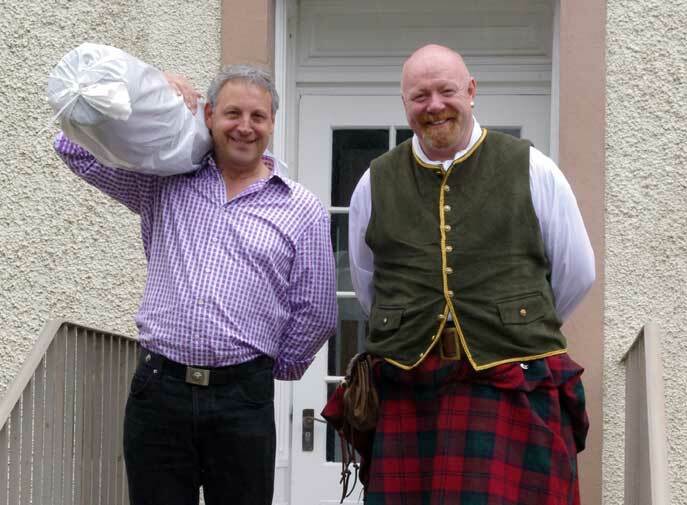 With the assistance of Ken MacDonald of Paisley, who has the knowledge of the production of tartan and kilt making. One bolt of cloth of 60 metres in length was made to be shared amongst the members of the Society of William Wallace, which in turn will be passed on to their future generations. 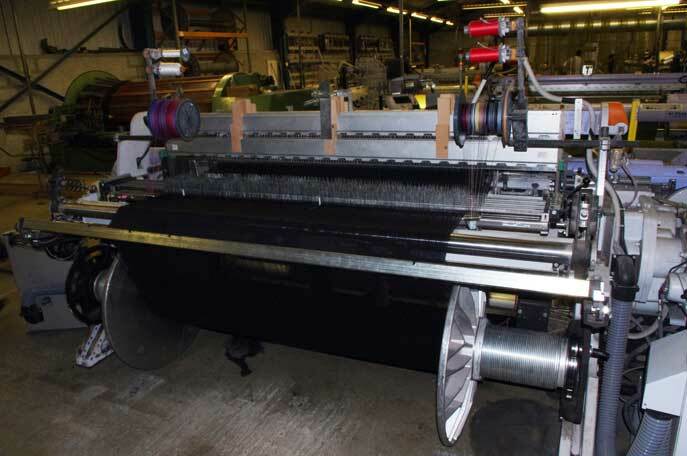 The unique length of pure wool fabric was woven on the Isle of Bute at Bute Fabrics. 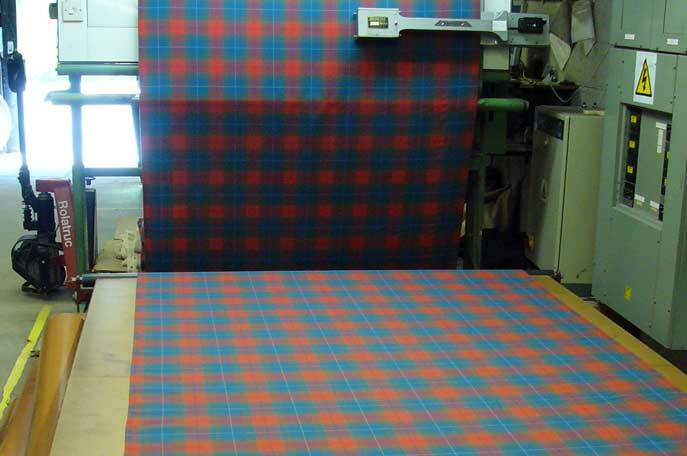 This small, independent company and employer of local Island people is one of the few remaining commercial weavers of tartans left in Scotland. 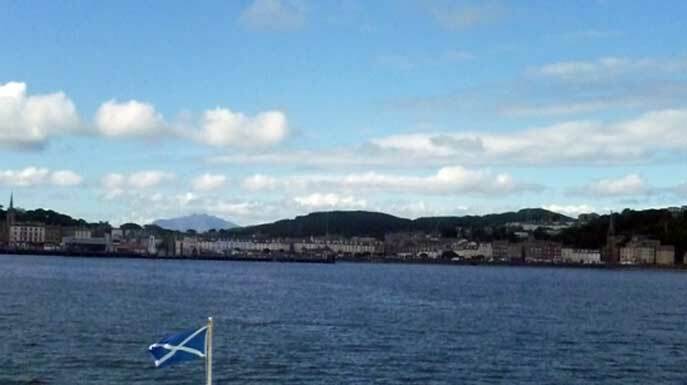 Bute is close to the birthplace of Wallace and has the historic link with Wallace in that many of the men of Bute were present alongside Wallace in his fight for freedom. Red…originally obtained in Scotland from the root of the madder plant. Symbolic of sacrifice around the world. The dominant shade of the cloth. 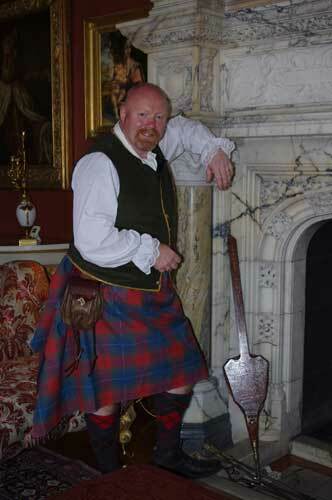 Steel Grey of The Wallace Sword… Symbolic of strength dedication and determination. The natural shade of granite of the Wallace Memorial in Elderslie. Brown….the bark of the Wallace Yew beside the memorial in Elderslie, one of the top 100 heritage trees in Scotland..
Green…the shade of the oak leaf. The site of the tree in Elderslie known as the Wallace Oak , situated a few hundred yards from the memorial but lost in the mid 19th century. It is said to have sheltered Wallace. Rust…a single line, a reminder of the Walk for Wallace completed by David R Ross in 2005 from the place of the capture of Wallace, to the place of his barbaric execution. It is also symbolic of the well in Elderslie used by locals in the past and considered to be good for the health to drink. Blue and grey…the core of the plaid. Symbolic of the cross in the sky seen before the battle of Athelstaneford as a sign of the blessing of Saint Andrew, later becoming the saltire, and symbol of Scotland. It will be worn first at the Scottish Parliament to commemorate the return of the Letter of Safe Conduct, itself a significant day in the modern history of Scotland, and at the centenary of the unveiling of the memorial on Wallace Day in Elders lie. Thereafter the cloth will hold the memories of those times and the people who have gone before and fought for freedom. Christine MacLeod July 9th 2012. Went to the Isle of Bute with my daughters Iona and Cara on the day of the weaving of the cloth for the Society of William Wallace. The building, now Bute Fabrics, was once a convent and an orphanage with the addition of the workshops to hold the ten or so looms. This west coast island mill works to create beautiful cloth, which is sent all over the world. It produces fabric now furnishing places like Hong Kong airport, The Glasgow Royal Concert Hall, and The Queens Gallery in Holyrood Palace.to name but a few. I met the managing director, James, and a number of other friendly staff, but spent most of the time with designers Catherine and Fiona. They gave us a fascinating tour of the weaving shop and all the techniques involved in the production. It was amazing to see how weaving has developed today from the old traditional handloom that I use in a village just a few miles over the water. When I first saw the piece of cloth for the Wallace Society being woven, it was an emotional moment. From the initial ideas for shades and thread count, designed to include important links with our patriot William Wallace, came a beautiful piece of cloth that I’m sure that many people will be proud to wear. 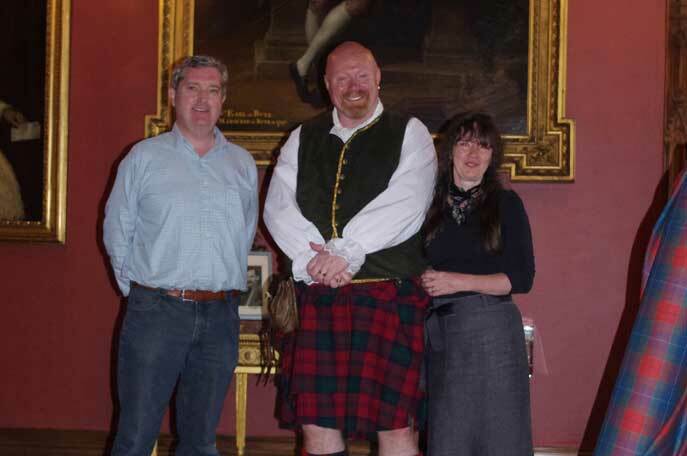 Stuart, the weaver, and a man of Bute. His equivalent in 1298 would have gone with Wallace to the Battle of Falkirk. We were then shown all of the processes of inspection that it will go through before it leaves the island. It will then pass to the finishers in Galashiels and Selkirk, before being returned to Ken MacDonald’s shop in Paisley for uplift by the members of The Society! 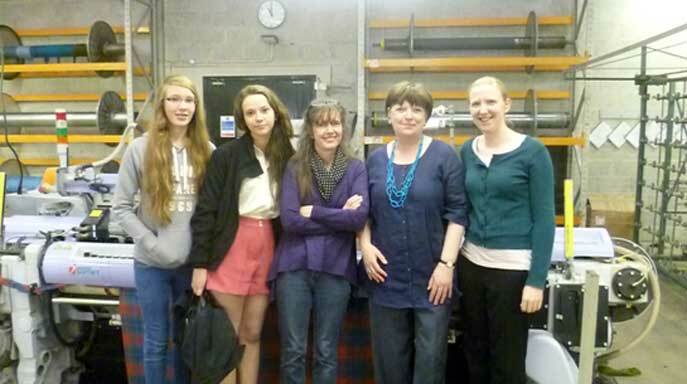 Left to right…Cara, Iona, me, Catherine & Fiona. The Society would like to thank Christine for not only this report but for all her work behind the scenes and her wonderful craftmanship in designing this wonderful tartan. It was a complete honour and privilege for me to go and collect the Society Tartan from Bute Fabrics with our good friend Christine McLeod who designed the tartan. It was a seven o'clock start on a terrible Scottish summers day, the rain never stopped but we made good time to catch the ferry to Rothesay where my kilted appearance raised a few eyebrows and a few chances to pose for some photos, well it's rude to say no. On the island first port of call was to pay our respects to the men of Bute who fell at the Battle of Falkirk with Wallace, the rain was not going to prevent us laying some flowers at the monument on behalf of the Society, another great idea from Christine. 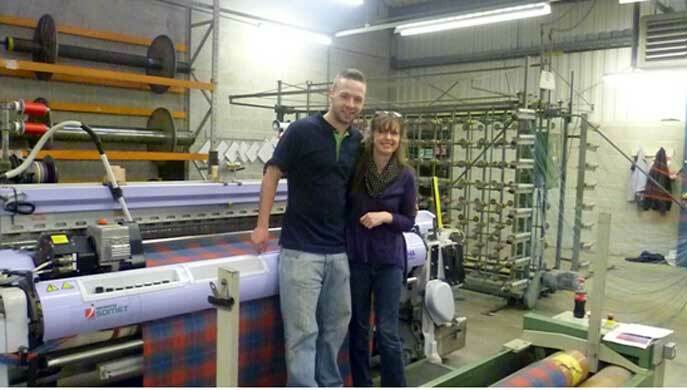 We then went to Bute Fabrics where we were treated to a tour of the building and a look at the process the cloth went through, our thanks to James, Catherine and Stuart for their kindness on this special day for us. 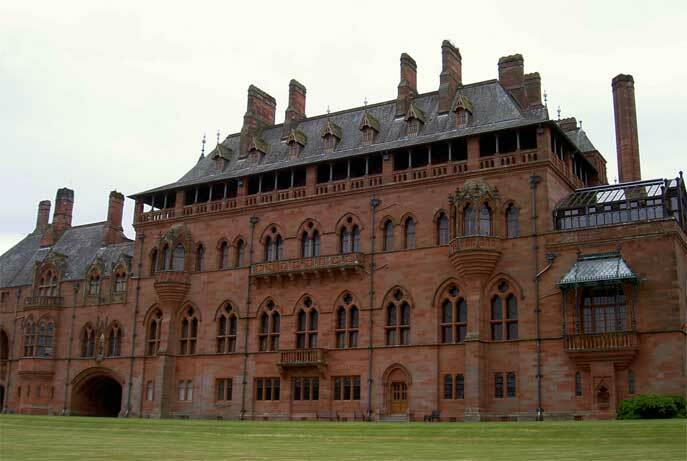 Next we got taken to Mount Stuart for the photo-shoot, what a place, a must visit if you can get over, highly recommended. Once the unveiling was done and enough photos recorded we thanked everyone for having us and were left to explore the delights of the house. I managed to fall down the marble staircase (hobnails and marble don't go together apparently) much to Christine's amusement, I'm sure she waited till she seen I was ok before she laughed so heartily. To everyone who rushed to my aid I'd like to thank you all, in the end it was only my pride that was hurt. A wonderful day filled with memories and giggles that will remain for a long time. I'd like to thank everyone we encountered on our trip, you treated us handsomely. A special thank you goes out to Christine, not just for her skills as a weaver but for being such lovely company.